Jill Herold’s widowed 92-year-old mother, Evelyn Mehlhop, had a broken hip and dementia, and clearly needed around-the-clock care. Yet Herold hated the idea of moving her into a nursing home, particularly after she toured facilities that lived up to her worst expectations—drab, highly regimented mini-hospitals with dim corridors and unhappy residents. Then she walked into the Leonard Florence Center for Living in Chelsea, Mass., where her first surprise was the aroma of baking cookies, not antiseptics. The lobby, known as Main Street, houses a bakery-café, a deli and a spa-salon, and there’s an outdoor garden for residents, among other amenities. “It was like an elegant hotel, about as far from anything medical as you could imagine,” Herold says. 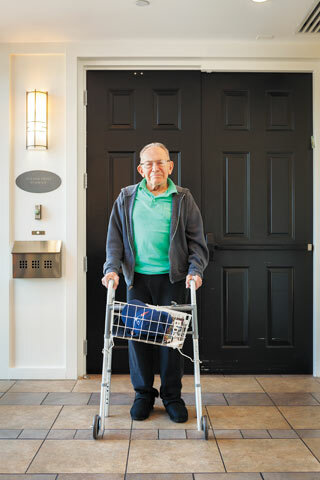 At the vanguard of innovation in the nursing home industry, the three-year-old Leonard Florence Center for Living exemplifies a new model of long-term care known as the Green House, and nothing about it seems institutional. Each of the five upper floors constitutes two separate “households” with private rooms for 10 residents. The normally dominant nurse’s station has been eliminated and instead there are common areas in each household—a living room furnished with comfortable sofas and chairs around a fireplace, an open kitchen and a communal dining table where residents often eat together. Cooking, housekeeping and even laundry are handled by two certified nursing aides known as shahbazim—derived from Persian, it means “nurturing of elders”—who also care for residents. Traditional nursing homes, in contrast, have clear demarcations separating housekeepers, kitchen workers, nurses and aides, who follow rigid schedules for serving meals or dispensing medications. Leonard Florence is far from the only nursing facility striving to create a homelike atmosphere and improve residents’ quality of life. Building a new Green House or undertaking a major physical renovation can be part of the strategy, but other nursing homes are primarily working to transform how they’re run, embracing a movement known simply as “culture change” that entails shifting away from the emphasis on efficiency and economies of scale that characterizes most nursing homes. Culture change typically requires an operational reorganization to give staff members more autonomy and to let residents have a say in even the smallest details of their lives. “It’s about not looking at residents as a task, but rather as who they are as individuals,” says Angie McAllister, a director of cultural transformation at Signature HealthCare, a privately held for-profit nursing home chain. 1. “Occupancy and Revenue Gains From Culture Change in Nursing Homes: A Win-Win Innovation for a New Age of Long-Term Care,” by Amy Elliot, Seniors Housing & Care Journal, January 2010. A study supported by the Commonwealth Fund analyzing culture change across 185 nursing homes, which found modestly higher occupancy rates, but significant improvements in revenue. 2. “Evidence Behind the Green House and Similar Models of Nursing Home Care,” by Sheryl Zimmerman et al., Aging Health, December 2010. A comprehensive examination of components of the Green House model, concluding supportive evidence for private rooms, access to the outdoors, residential-style dining, self-managed teams and other characteristics. 3. “Nurse Staffing and Deficiencies in the Largest For-Profit Nursing Home Chains and Chains Owned by Private Equity Companies,” by Charlene Harrington et al., Health Services Research, February 2012. The first study to focus on the staffing and quality of care in the top 10 for-profit nursing home chains, which found lower staffing and higher rates of failure to meet federal nursing home quality standards than at government-owned facilities.